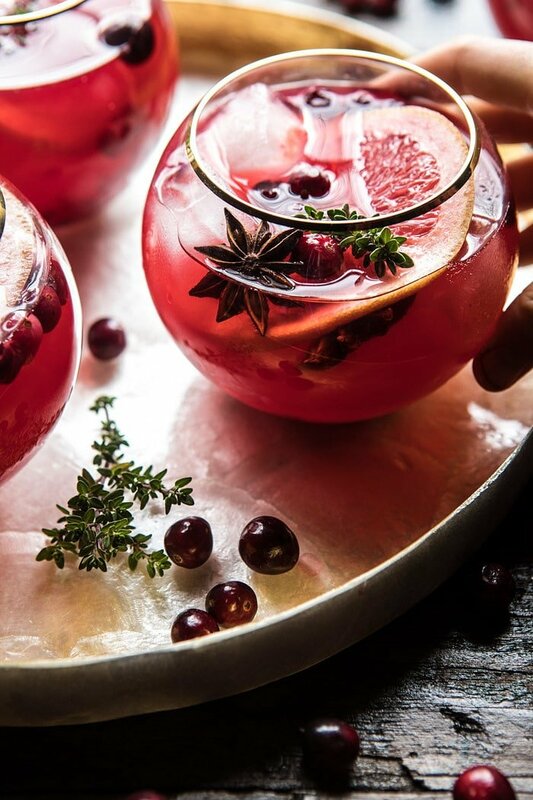 So excited to be sharing this festive and fun Cranberry Thyme Spritz with you guys today. Happiest Saturday everyone! I’m writing today’s post from my hotel room in NYC, and I must say, I’m sad to be getting ready to leave this incredible city. To be honest, I wasn’t sure if I would love the city as much as most, but I have had such a great time on this trip, and am already planning my next trip back (literally). Can’t wait to give you guys all the details in tomorrow’s Favorites post. So much to share! For now, I am dying to share one of my favorite cocktails I’ve created to date…this one is just so good. Plus, I absolutely love how festive it is. You guys all know I am a sucker for a festive cocktail, see here and here. I realize I might be jumping into the “holiday” recipes a bit too soon, but with Thanksgiving so early this year (we are less than two weeks away!) and after a week spent in very festive NYC (and they’re not even fully decorated for the holidays yet! ), I just could not help it. Hoping you’re all on the same page as me! 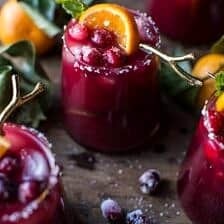 With every Thanksgiving, I love creating a new punch style recipe that easily feeds a crowd and is simple to make. 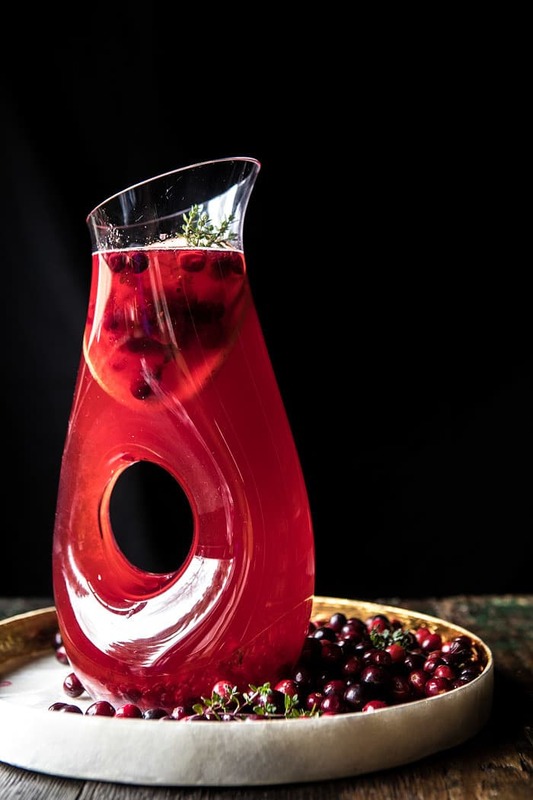 This cranberry thyme spritz is this year’s party punch. 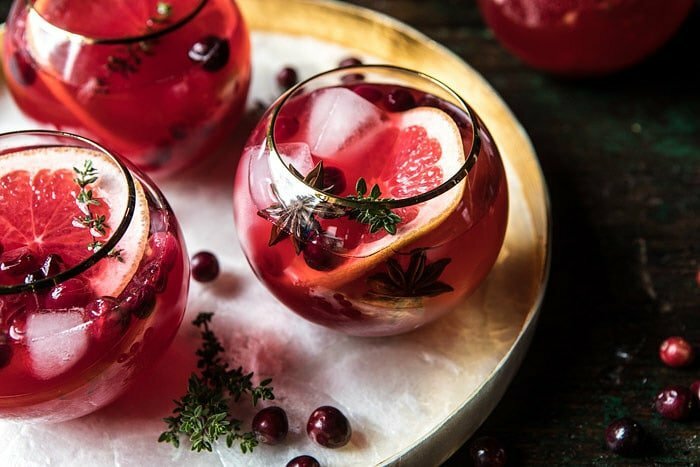 Not only is it extra festive and pretty, but it’s sweet, hinted lightly with flavors of thyme, spiked with a little vodka, and made with my very favorite, elderflower liquor. I used honey for sweetness, to balance out the tart in-season-cranberries, and both grapefruit and lime juice, for a nice hit of citrus. It’s basically the perfect sweet holiday drink. 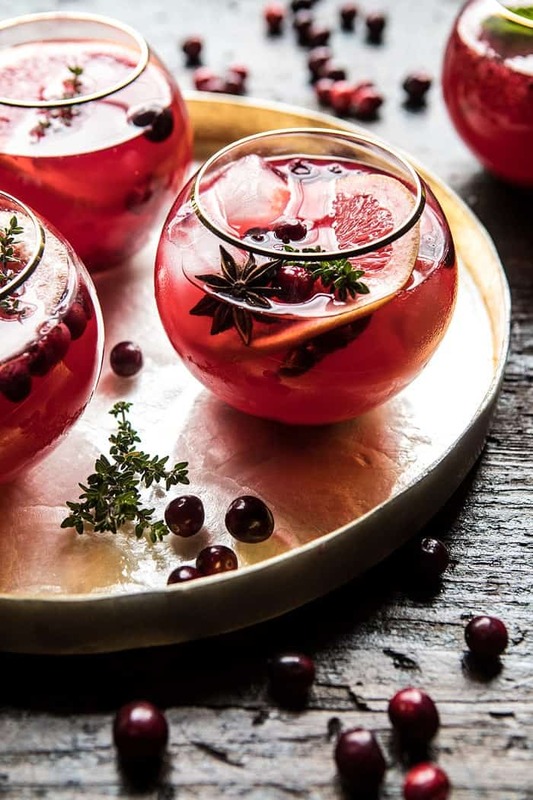 I know that traditionally when most people think of cranberries they immediately think cranberry sauce, but I’m a huge believer that cranberries can be used in so many other delicious ways…like this spritz. 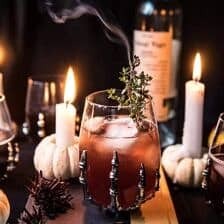 Trust me, once you try this drink you’ll be wanting to make up a big batch of these come Thanksgiving Day! 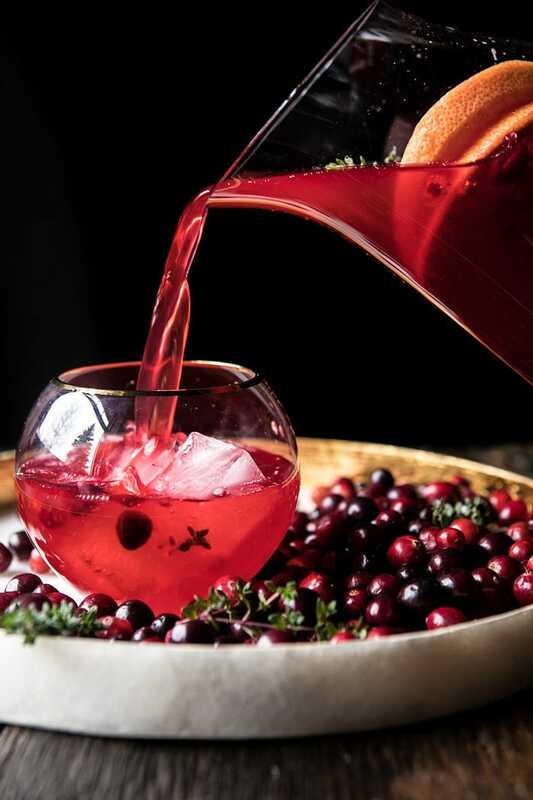 This cranberry thyme spritz is this year's party punch. 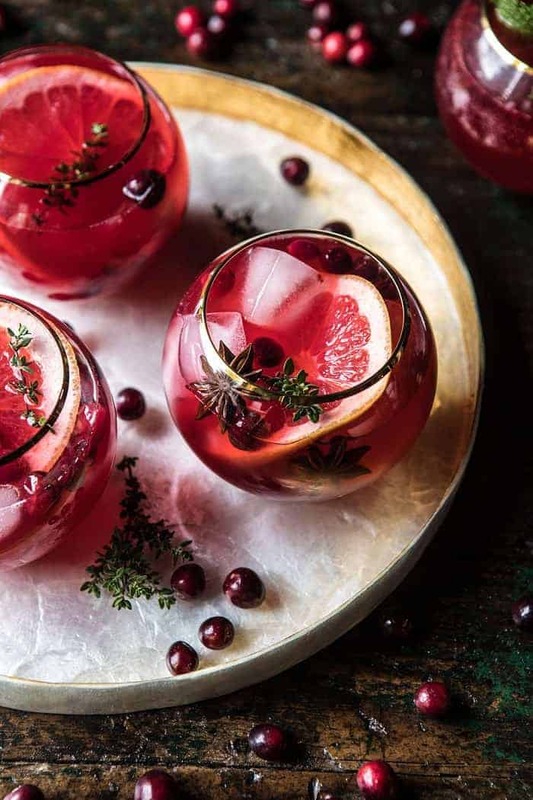 Not only is it extra festive and pretty, but it's sweet, hinted lightly with flavors of thyme, spiked with a little vodka, and made with my very favorite, elderflower liquor. It's basically the perfect sweet holiday drink. 1. 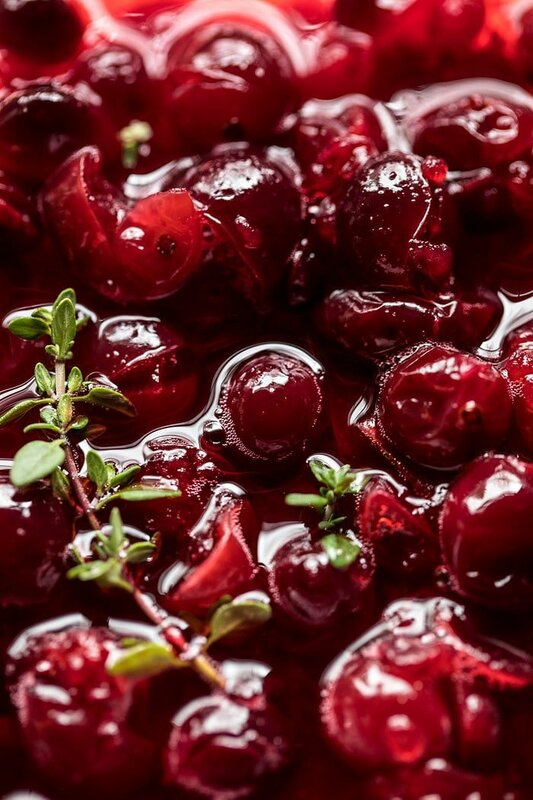 In a medium pot, bring 1/2 cup water, the honey, cranberries, thyme, and ginger to a boil over high heat. Boil 5 minutes or until the cranberries begin to burst, then remove from the heat. Let cool. Remove the thyme and ginger. If desired, strain out the cranberries. 2. 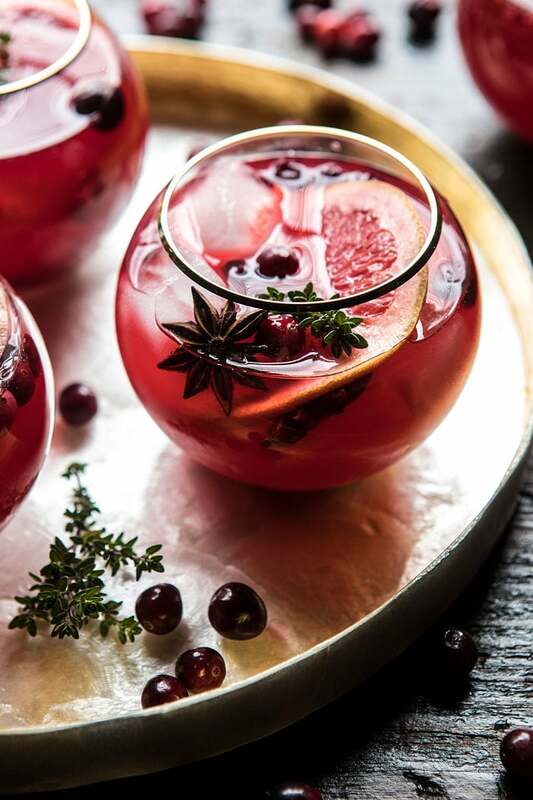 In a large pitcher, combine the cranberry syrup mix, vodka, elderflower liquor, grapefruit juice, and lime juice. Chill until ready to serve. 3. Add the ginger beer just before serving. 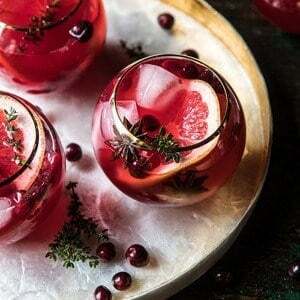 Garnish each drink with a grapefruit slice and star anise, if desired. this cocktail looks so refreshing and tasty. I will obviously try it. thanks for sharing your recipe. Yum! I’ve been looking for something like this for the holidays! Approximately how much of the cocktail mixture goes in each glass before topping it with the ginger beer? Like 4 oz maybe? I️ like to leave a little notecard out with directions and a liquid measure for guests to mix up their own drinks so nobody goes thirsty! Thanks! So pretty, this is a must make for Thanksgiving! Totally agree! I hope you love this! Sorry been so offline…having sadly many great friends passing and feeling the fallout of it. additional lime juice or an alternate juice fruit? Thanks!! Is there another kind of citrus you think would work well besides grapefruit? I always find it overpowering and too tart when I have it in drinks. Do you think I could make it the day before minus the ginger beer and keep it in the fridge overnight? I want to serve it at Thanksgiving. Thanks! Hello! I’m so excited to make this for my family for Thanksgiving this year! It looks delicious. I was wondering how much ginger beer and how much of the cocktail goes into each glass. I don’t want my ratio to be off. Love the pictures! Thank you for this! 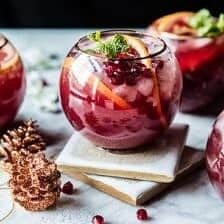 That punch looks delicious : perfect for my leftover cranberries for new year! I am in love with the glasses you used, would you happen to remember where you found them? 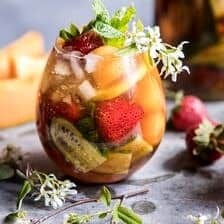 This recipe was so delicious and refreshing. It was not too difficult to make either. I received so many compliments on it during thanksgiving this year, as well as many requests to share the recipe! LOVED! That is so amazing! I am so glad all your guests loved this Carson! Thank you!